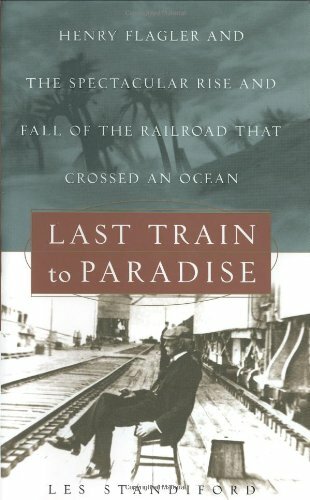 Publisher: Crown Pub, New York, New York, U.S.A.
Last Train to Paradise is acclaimed novelist Les Standiford’s fast-paced and gripping true account of the extraordinary construction and spectacular demise of the Key West Railroad—one of the greatest engineering feats ever undertaken, destroyed in one fell swoop by the strongest storm ever to hit U.S. shores. In 1904, the brilliant and driven entrepreneur Henry Flagler, partner to John D. Rockefeller and the true mastermind behind Standard Oil, concocted the dream of a railway connecting the island of Key West to the Florida mainland, crossing a staggering 153 miles of open ocean—an engineering challenge beyond even that of the Panama Canal. “The financiers considered the project and said, Unthinkable. The engineers pondered the problems and from all came one verdict, Impossible. . . .” But build it they did, and the railroad stood as a magnificent achievement for twenty-two years. Once dismissed as “Flagler’s Folly,” it was heralded as “the Eighth Wonder of the World”—until a will even greater than Flagler’s rose up in opposition. In 1935, a hurricane of exceptional force, which would be dubbed “the Storm of the Century,” swept through the tiny islands, killing some 700 residents and workmen and washing away all but one sixty-foot section of track, on which a 320,000-pound railroad engine stood and “gripped its rails as if the gravity of Jupiter were pressing upon it.” Standiford brings the full force and fury of this storm to terrifying life. In spinning his saga of the railroad’s construction, Standiford immerses us in the treacherous world of the thousands of workers who beat their way through infested swamps, lived in fragile tent cities on barges anchored in the midst of daunting stretches of ocean, and suffered from a remarkable succession of three ominous hurricanes that killed many and washed away vast stretches of track. Steadfast through every setback, Flagler inspired a loyalty in his workers so strong that even after a hurricane dislodged one of the railroad’s massive pilings, casting doubt over the viability of the entire project, his engineers refused to be beaten. The question was no longer “Could it be done?” but “Can we make it to Key West on time?” to allow Flagler to ride the rails of his dream. Last Train to Paradise celebrates this crowning achievement of Gilded Age ambition, a sweeping tale of the powerful forces of human ingenuity colliding with the even greater forces of nature’s wrath.